You can use EasyMapMaker Advanced Options (with a Pro or Premium plan) to add a radius around any or all of your locations you choose to map. You can select the radius to be in kilometers or miles. You can use one of our predefined values or use your values. Radius around a point is for display purposes. To filter by radius or export within a radius use the radius filter. The radius around the pin will only be displayed when the pin is displayed. If the pin is hidden in a cluster the radius will be hidden as well. Add a radius column to your excel data, set the value to 0 if you do not want a radius around a point. Another option is to use a pre-defined value for all your pins. Select the "Enable Radius around Pins"
Custom radius values are in either km or miles and must not be greater 2000. The color for the radius is the same as the color for the pins when not using custom images. When using custom images the color for the radius is the same as the color for the cluster. 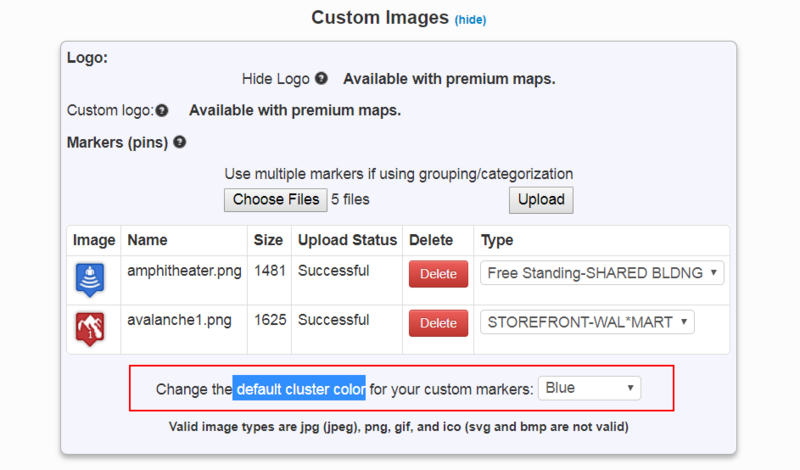 The color for the cluster (and radius) can be changed in the custom image section as shown in the image below. Check out the sample video for adding a custom radius around 2 out of 12 pins. 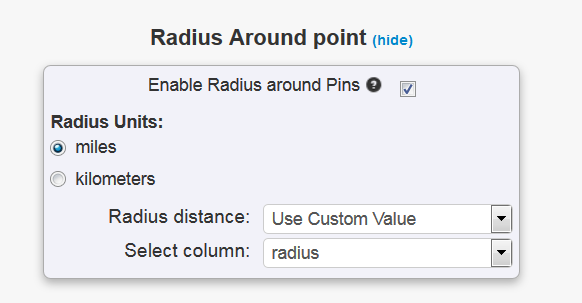 Overview of adding a custom radius around pins using easymapmaker.com Add a custom radius around any or all your pins. The video shows how to add a radius value around 2 out of 12 pins. To make a map like this yourself, download the sample file and follow the instructions (above).